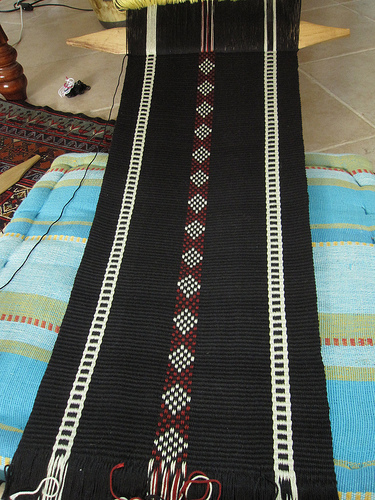 I would like to share something that Alaa wrote in the Ravelry Backstrap Weaving Group this evening quoting from the book published in Kuwait Al Sadu: The Techniques of Bedouin Weaving. “The word Al Sadu in Ibn son of Mandhurs’ Lissan* Al Arab* The Tongue Language of the Arabone of the earliest known encyclopedia dictionaries of the 13 C denotes the extension of the hand towards an object, as when camels move forward with their forelegs. The word Sadu equally implies the movement of the head as in the way camels and horses move their heads thrust forward. Earlier, Al Jawhari (d. 398 Hijri) in his book Al Sahah also means the long and gentle stride of the camels. Al Sadu is the term used for warping and means what is extended. Extending, stretching and spreading…fitting words to have in mind when one thinks about the process of warping or even to apply to this idea of the Worldwide Weaving Web that I often refer to…which allows designs and textile techniques from people thousands of miles away in a dry sandy desert to enter the home of someone in humid jungly lowland Bolivia. I read so many comments in the online weaving groups about the “joys and traumas” of warping. I don’t think I will ever think of it in quite the same way after that lovely description of the meaning of Al Sadu….that graceful extension of head and limb and thread….beautiful! Some people love warping and see it as relaxing, some detest it, while others fear it. And then there’s the old “back-to-front” versus “front-to-back” debate…that’s floor loom talk…I have little idea of what all that means but I do know that there usually isn’t just one right way to do things. 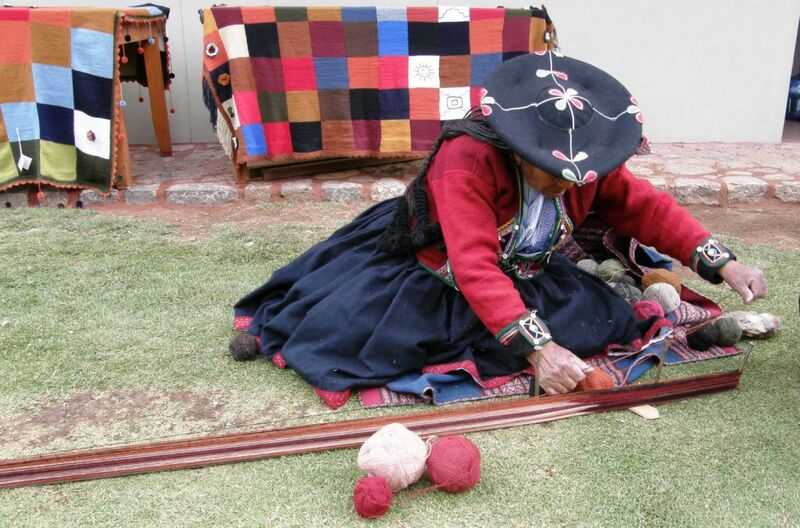 I love learning about the way warps are created for the simple looms I see in use here in South America and around the world, whether they be for backstrap weaving, or for the horizontal, vertical loom or leaning loom. Sometimes all it takes is a toe and a forefinger…two points around which the threads can turn and measure out the length of the warp with a simple cross between. For certain woven structures a startling amount of stakes are required so that the weaver can carefully place all the threads in their correct positions before the warp is transferred to the loom. Of course it also depends on whether the weaver is creating a circular, dovetailed, discontinuous or single-plane warp. For those not familiar with circular warps, think of the inkle loom. You can see above left the very short sample warp I wound on my inklette and removed for this picture. 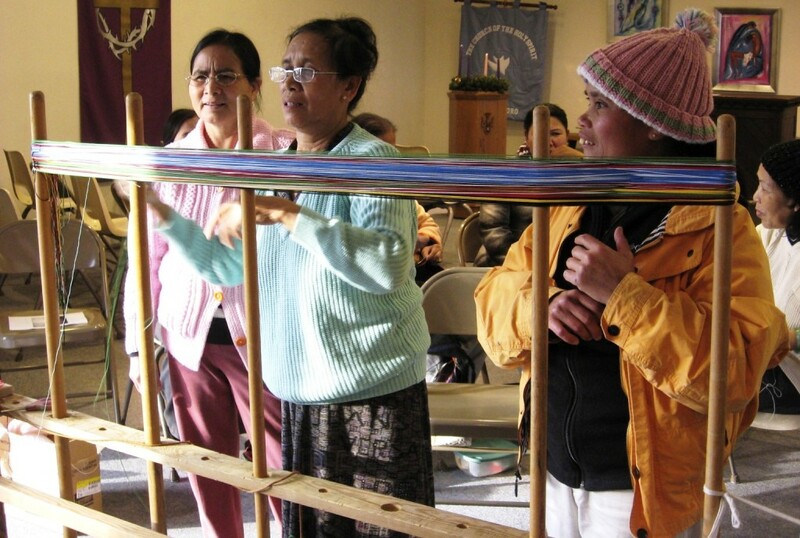 When the band on the inkle loom has been woven, it is cut and opened up to its full length. Above right you see the same circular warp next to a warp that was created in a single plane for my backstrap loom. The finished inkle band will open out to be longer than the other one. 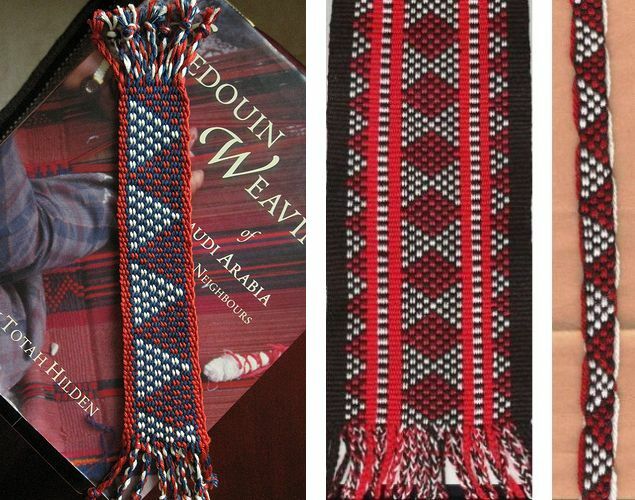 Both kinds of warp are commonly used for backstrap weaving. A circular warp provides a practical way for long pieces to be woven on a backstrap or other loom without needing a large space in which to work. Warping for a large single-plane warp-faced piece may require two very long stakes between which the weaver walks carrying the thread. 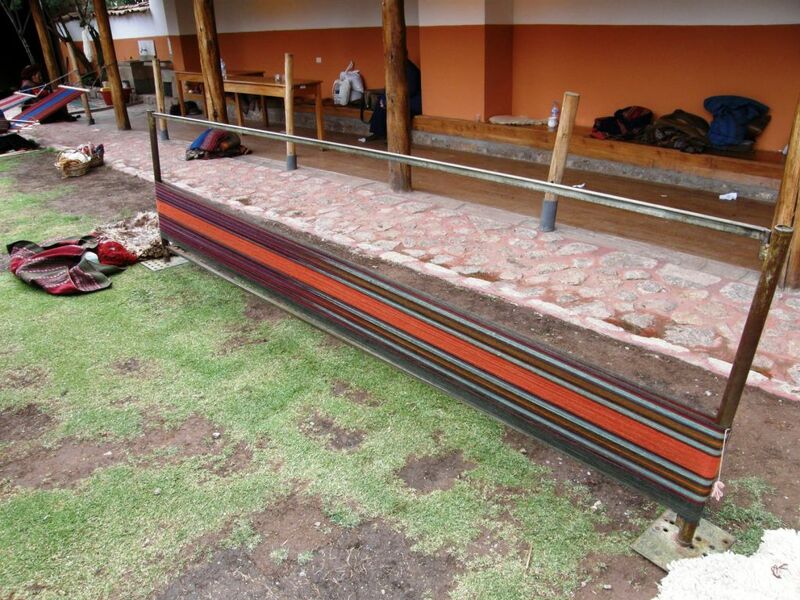 The weaver who was creating this warp in Chinchero was working alone. I have been told that often two weavers will sit, one at at each stake, and roll the ball of yarn to each other. The warp end nearest the weaver must be clamped or stabilized, as you can see, so that it won’t slide around the loom bar as the weaver beats. Indoors at a gathering of weavers in Santa Cruz, Bolivia, Chinchero weavers used table legs around which to warp practice bands. The same table was even used by a Guarani weaver to demonstrate the dovetailed warp that she uses on her vertical loom. 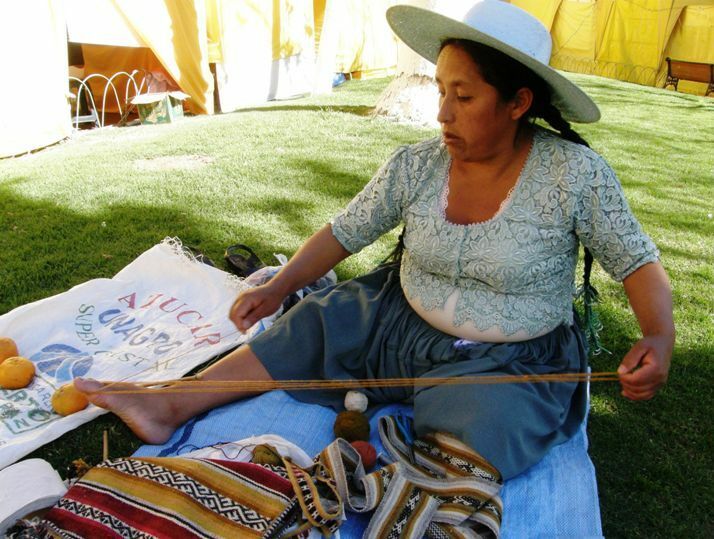 The dovetail warp occupies one end of the table while an Aymara weaver from Chile winds her single-plane warp on the other. Often warping can involve more than one person. 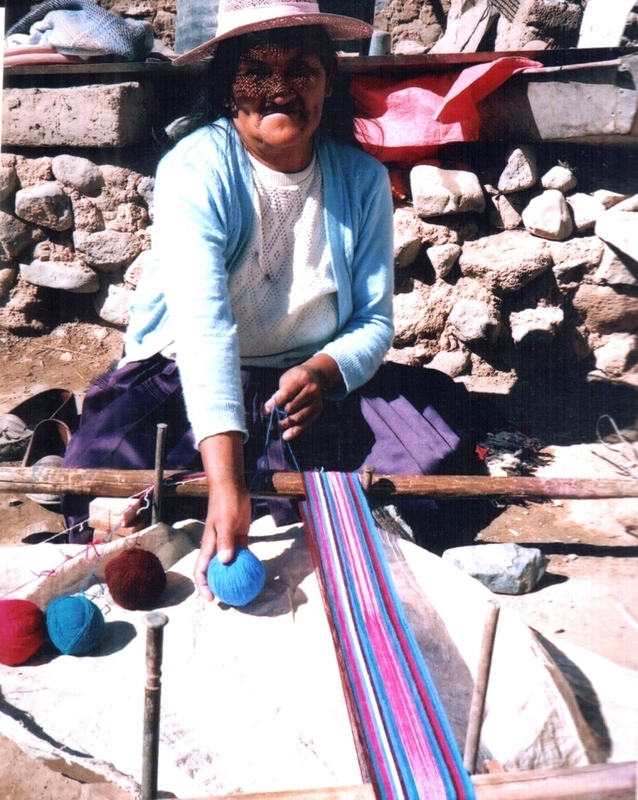 Above, Hilda and I in Potosi Bolivia, are warping the horizontal loom for warp-faced double weave embedded in plain weave. She is about to roll the ball of yarn to me so that I can turn it around the loom bar before rolling it back to her. Mapuche weaver Marta and I warped together at the recent exhibit in DC which meant I couldn’t get a video of the process but warping with her rather than filming was much more fun! Beth from Beer Sheva in Israel gave us a link to a wonderful set of videos on Bedouin weavers in Lakiya village in Israel. One of the videos shows how it takes three people and a lot of walking to warp their long horizontal looms for the making of warp-faced carpets. You may remember the next video that I posted some time ago of the poncho weaver from Paraguay warping her tremendously long single-plane backstrap warp, carrying the thread up and down on her own for three hours. I love watching that weaver at work! Which all brings me to the warping tutorial I promised this week for the Bedouin al’ouerjan patterns which are woven with the warp substitution technique. Tracy in Qatar and Helena in Brazil have been playing with these patterns as well as a couple of other members in the Ravelry backstrap group. You can see Tracy and Helena’s work above. We have all fallen in love with these patterns. We had fun playing with one of the many versions of this pattern when I wove with friends in California. We combined the technique with weft twining. And look at Tracy’s latest project!! You will find the tutorial on warping the al’ouerjan patterns here. The weaving technique (warp substitution), which you will need to learn first, is detailed in a tutorial here. 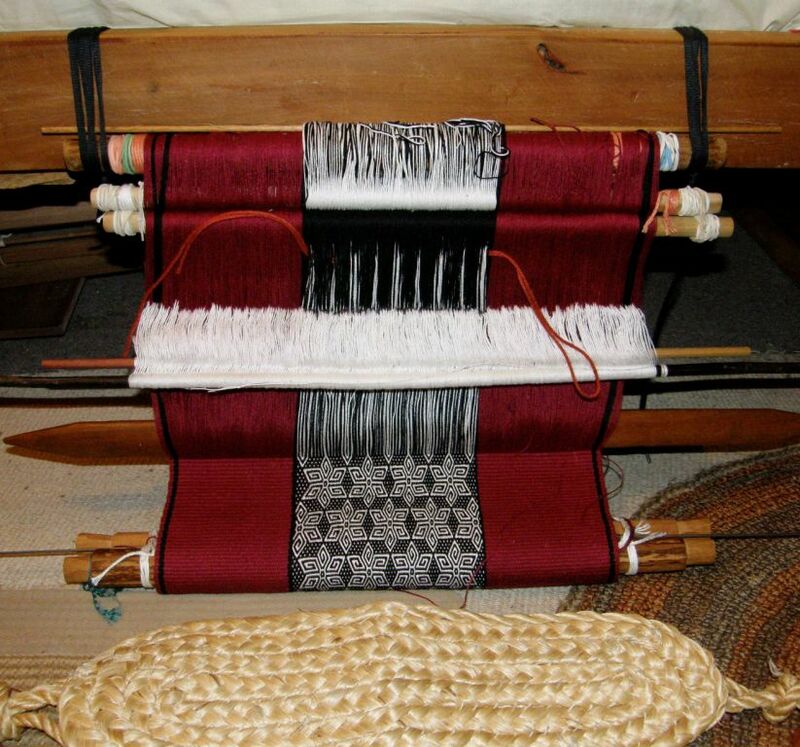 A tip for securing the warp floats that are typically created on the backs of pieces woven in this technique is within this blog post. And, thanks to Alaa in Jordan and several other people who pointed out to me the Interweave newsletter this week that included a link to a video on Bedouin weaving on the UNESCO site which is definitely worth watching. UNESCO were kind enough to give me the embed code but WordPress doesn’t like it! So, here’s the link. I just love how the loom is perched over mounds of desert sand. Nothing could be further removed from this moist jungly place in which I live. Earlier I mentioned a link that Beth in Israel provided which leads to a page with several videos on the Bedouin weavers of the Lakiya Negev Weaving Project. The one on finishing techniques is very nice. And here’s the link to the page with all eight videos. Here it is all rolled up and reaching the end. It will be a wall hanging so it doesn’t need to be any specific length but I would like to weave as much as I can on it. I will change those thick cross sticks for thin ones and replace the end loom bar with piano wire and then lash that to the loom bar. That will give me more working space. I am still thinking about twining a design into the end. In the meantime I am itching to warp up the next wide piece in these same colors…another wall hanging inspired by the Chilean chamantos. Roman K sent me this image of this beautiful man’s wool sash that he owns which is from western Podilia which Wikipedia tells me is in south-western Ukraine. 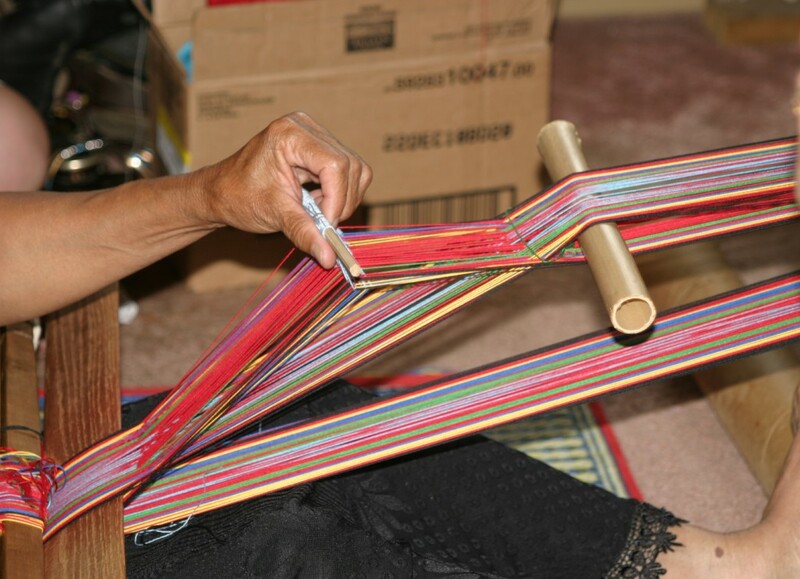 This sash has been woven in the simple two-color warp float technique but we are not sure as yet what kind of loom was used. Roman is a great resource for information on traditional folk clothing and embroidery. 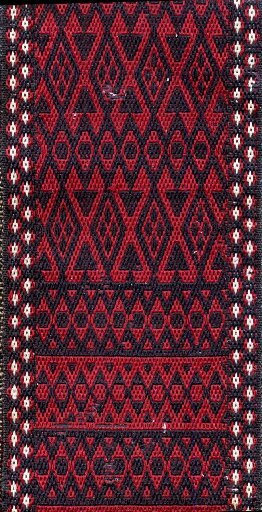 My online friend Sharon first sent me a link to his post on Central Asian embroideries and, while looking around his extensive website, it occurred to me that he may know something about the origin of the complementary warp weaving technique on some of the Russian Old Believer belts that I have been studying. 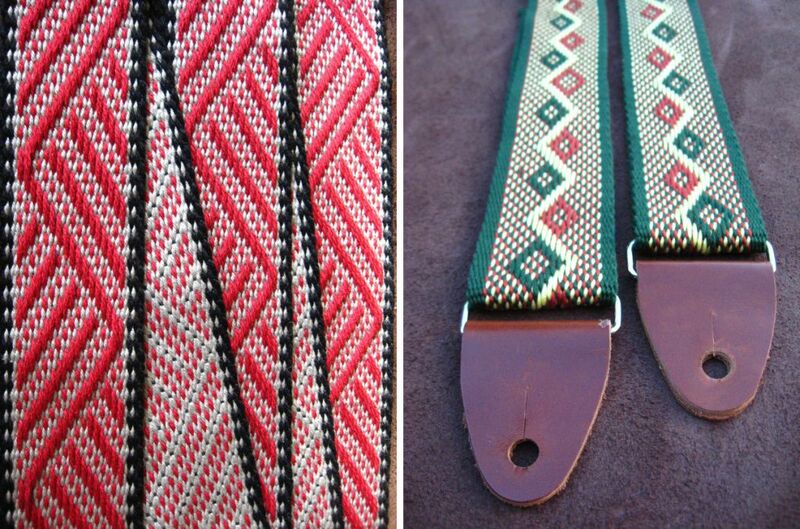 He has sent me pictures of other gorgeous sashes and belts which I will save for another post. I know that my weaving friend Annie will be eyeing that sash. She is building a nice collection of sashes from around the world which I got to admire when I stayed with her this last fall. On top of that she weaves guitar straps and sashes of her own design on her inkle looms…emphasis on the plural…I think she has about seven inkle looms and is forever creating new and unique patterns. It really seemed to me that her creative process was completely natural and effortless. There was no charting and not a calculator in sight. She just seems to pick up this color and that, move her skeins and balls of yarn around and then come up with something fabulous. 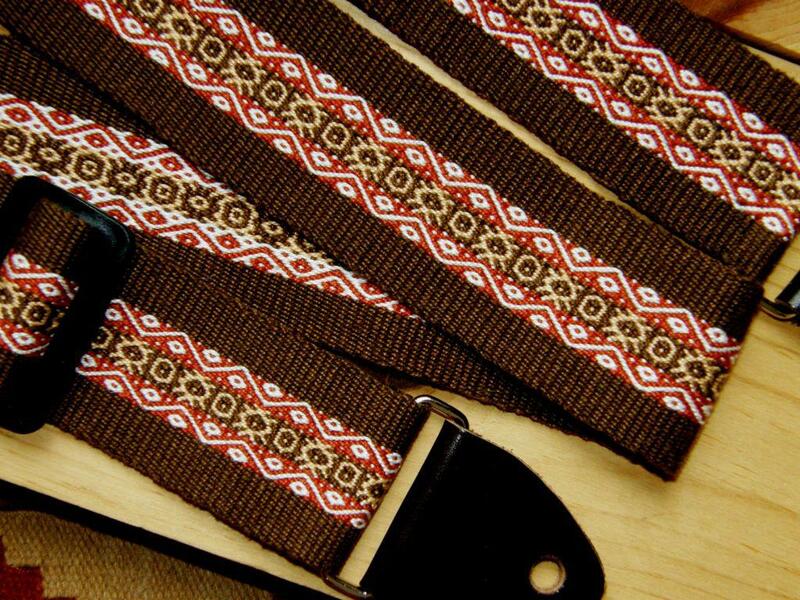 I think it is a wonderful opportunity to add a splash of color to the end of this blog post by showing you some of the guitar straps that Annie, aka AspinnerWeaver, creates and sells in her Etsy store. These are done in plain weave with all the patterning created in the warping, letting the colors do the talking. She has taken the supplementary warp technique and really run far with it working it into her own unique patterns. Color!! She has made minimal but very effective use of the simple warp floats technique in these next two straps and turned out two gorgeous designs. Mental note: never fear the half revolution on the warping board…a lot of these clever warp designs that Annie has created require half revolutions when winding a single-plane warp which is something I usually just don’t bother with to avoid having knots at my starting end (not a problem with circular warps)but, then again, not really a problem with single-plane warps either especially if you plan on starting with a fringe. And one last supplementary warp color burst and a two-color warp float strap that is one of my favorites. 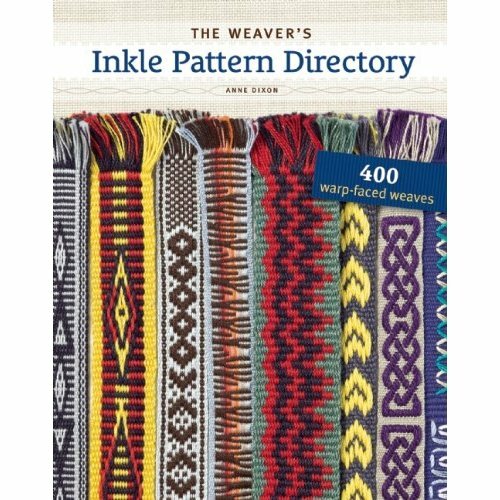 Have this got you all keen to warp up something on for your inkle or backstrap looms? If you are in need of even more inspiration check out Annie’s Flickr guitar strap album. I was asked recently to make a guitar strap for a friend. I chose to make it in my favorite pick-up technique…you guessed it, pebble weave. I added in a couple of extra heddles which made it quite fast to weave. I happened to mention to Annie that I had to make a guitar strap and the fact that I would need to buy the hardware to finish it. In the mail arrived a package from her with all the pieces necessary to complete my project. What I didn’t realize at the time is that she actually cut the leather pieces and put it all together herself. Better still, she is selling this now here so you can weave your own guitar strap and have everything you need to finish it off beautifully. I definitely owe my boyfriend a new guitar strap. The pebble weave one I made him is constantly being confiscated and taken with me on the road to show friends. There has been some buzz in the inkle and backstrap groups about Anne Dixon’s book which is due out next summer I believe. I am happy that I will get to meet her at the Braids 2012 conference in Manchester next August….400 warp-faced weaves. Imagine! It seems so far away now but time is bound to fly. And what about Convergence and Maryland Sheep and Wool? Are you planning to go? I hope I will meet some of you at at least one of these events. Well, back to my red, black and white pebbly Starry Night piece and hopefully I will have the start of piece number two in this series to show you next week. Your world-wide weaving web is astounding and I am glad to be caught up in it! You knew that when I saw that sash from the Ukraine I’d want one for my collection. Tracy’s piece is beautiful, your star piece is beyond words, and i’m not surprised that those al’ouerjan patterns seem to be popular all around. There is some mouth watering stuff here, for sure. I feel like whenever I combine red, black and white it is pleasing. Red, black and turquoise is another favorite, too. Thanks again. Laverne. Wonderful videos! That UNESCO one is so good, and gives you a real taste for our surroundings. Thoughts on warping are so helpful – it’s easy to let it become scary. I’m going to make very good use of the al’ouerjan tutorial. Very interesting this blog post. Thank you for exposing my weaving. You are lovely. !!! That is the first I have heard of this new book and I am SO excited!! I love all of Annie’s straps! I spent the better part of an afternoon drooling over all her wonderful photos awhile back. I will have to think about the stretching and extending next time I warp my floor loom. Maybe it will make it less tedious for me! No, I won’t Bonita but I may be demonstrating there. I saw that you had signed up for my class at the Potomac Guild and had to cancel. Perhaps you could make it to one of my classes at The Mannings. They will have their 2012 class schedule out in January. I’ll look for it! I have been following your blog avidly for quite awhile, and would sure love to take your class. I was really bummed out that I couldn’t make it to your class this fall. I forgot to mention that the classes at The Mannings will be on the two weekends immediately after Maryland Sheep and Wool.